Our good friends at Worldwide Auctioneers just sent us this description of a fine Bel Air Convertible they are selling in 6 weeks at their Houston Classic Auction. I’m guessing the guys at the American Tri-Five Association will be watching this one, too! 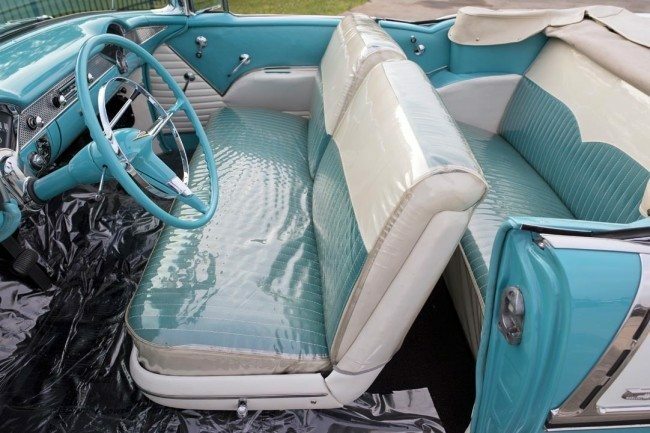 Chevrolet’s top-of-the-line Bel Air convertible was dripping with class and gleaming with chrome in 1955, and it was just the car for any occasion and the public loved it. For 1955, the full-sized Bel Air received all new styling and exciting new V-8 power. It was 15 feet long and lower than anything we’d ever seen, with a sleek wrap-around windshield. Called the “Hot One” in GM’s advertising campaign, Chevrolet’s styling was crisp and trendy, with a Ferrari-inspired egg-crate grille and hooded headlamps. 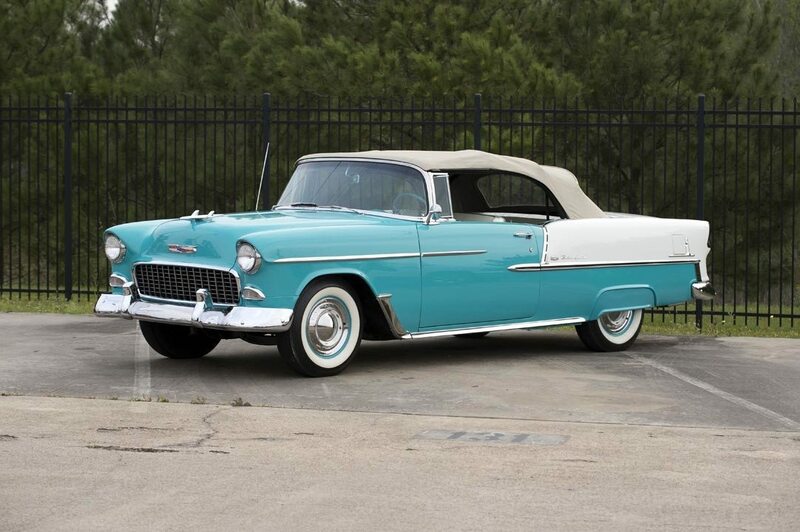 This beautiful Bel-Air is equipped with the original 2-tone color-coordinated turquoise and white upholstery, matching interior carpet, chrome spears on the front fenders, stainless steel window moldings, and full wheel covers. 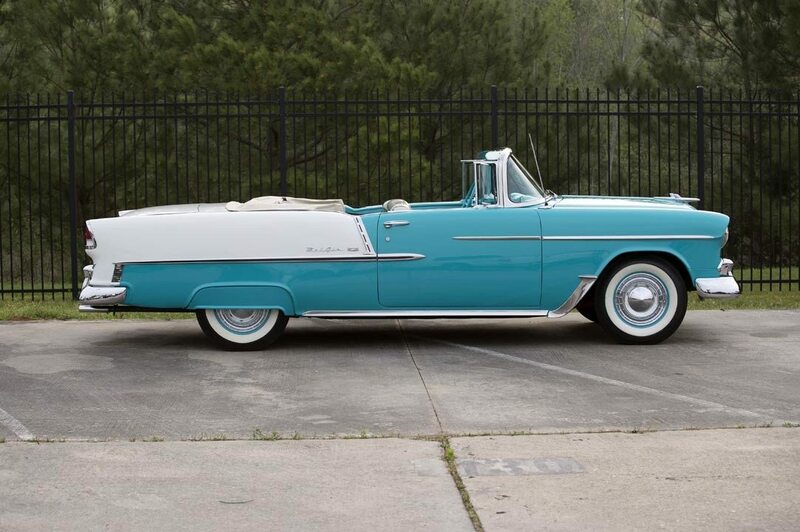 A power top mechanism and power brakes were standard, and with that racy 2-tone paint and trim that didn’t quit, this Bel Air convertible was one of the most exciting cars available in 1955. 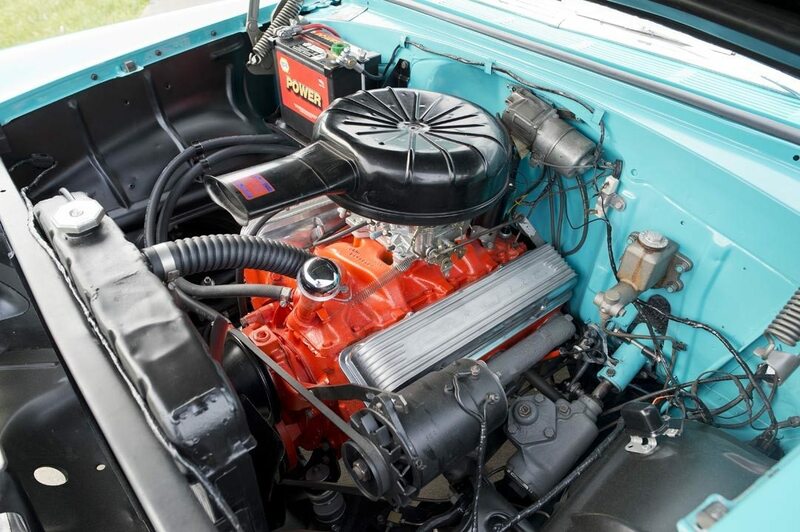 For 1955, Chevrolet gained the legendary small block V-8 engine option, and most were shipped with the reliable three speed Synchro-Mesh manual transmission, with a few choosing the optional overdrive featured on the example available today. The new 265 ci V-8 in this car is freshly rebuilt, and features a modern, overhead valve, high compression, short stroke design that was so good that it remained in production in various displacements for many decades. Motor Trend magazine gave the Bel Air top marks for ride and handling, and Popular Mechanics reported acceleration for the V-8 Bel Air as being 0-60 MPH in 12.9 seconds – no small feat for a 3,300 lb. car. Also new for 1955 was the 12-volt electrical system, improved brakes, and the Glide Ride suspension system that was a big hit. Base sticker price on the convertible was $2,321. 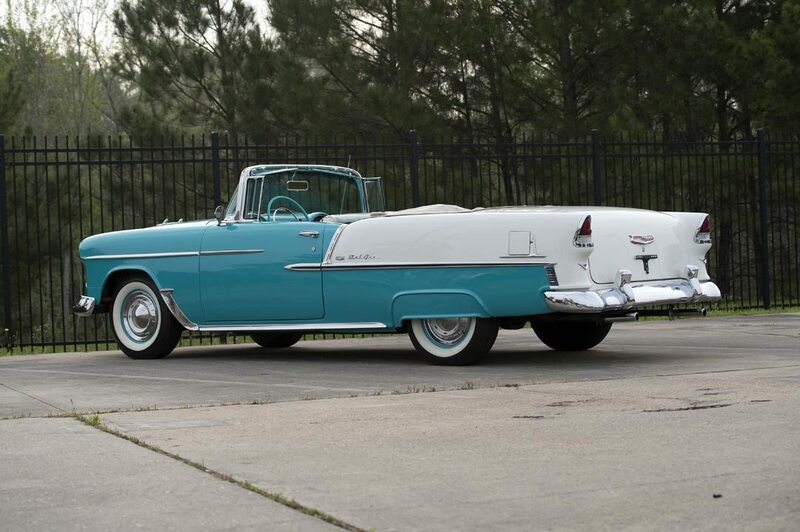 This clean and correct Bel Air Convertible, in the iconic Turquoise and White livery, has a lovely look throughout, with a fine original paint finish and plenty of deep chrome. The new wrap around windshield and all other glass is in fine condition, it has a newer off-white convertible top, and the optional equipment includes an AM radio, deluxe heater, and factory fender skirts. It’s a great looking car with the top up or down, and with room for 5, you’ll soon be cruising with your friends and showing the car off at car shows. Look closely, and you’ll be impressed with the condition of this car, from the interior that is still wearing it’s clear plastic seat covers, to the engine bay, where the small block V-8 sits royally with plenty of elbow room in the clean and properly detailed engine compartment. The paint has a deep shine, the original chrome is very nice, the stance is correct, and it’s an absolute blast to drive. 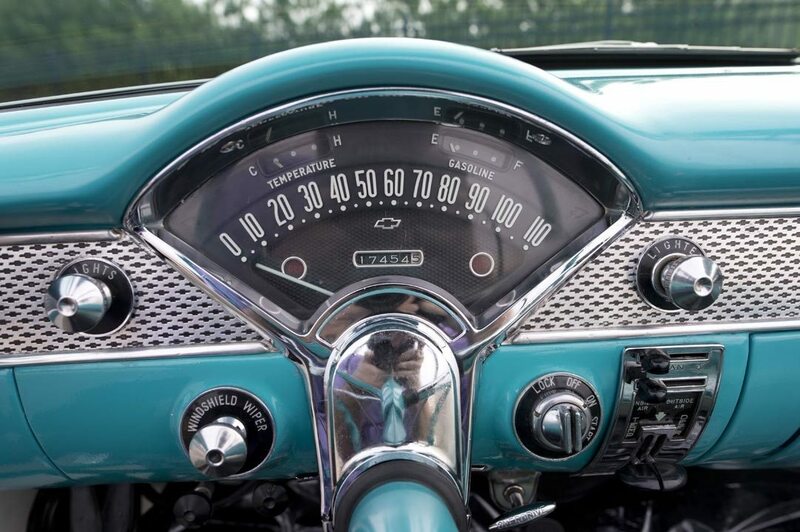 It’s no wonder that the Tri-Five Chevys are held in such esteem – with fresh, iconic styling every year, they truly represent an automotive sweet spot in the 1950’s. They made top-down motoring something everyone could afford, and the consigner reports that the “Turquoise and White Convertible turns as many heads as any car I’ve ever owned – people just love it”. From Two-Lane Blacktop to American Graffiti, from dragstrips and dirt tracks around the country, and in clubs like the Tri-Five Association and the NHRA, few cars have earned a higher place in the collective American gearhead psyche than a ’55 Bel Air. Visit www.worldwide-auctioneers.com for the full details on this car, and maybe you can make it your day to own one of Detroit’s all-time great American convertibles, and join the American Tri-Five Association! If you have a Chevrolet Bel Air or another collectible you’d like to insure with us, let us show you how we are more than just another collector vehicle insurance company. We want to protect your passion! Click below for an online quote, or give us a call at 800.678.5173.